1. A successful Secret Santa in the office. Everyone had fun, everyone laughed a little all week and I received a sweet photograph taken by one of my employees. How he knew I liked black and white photography and ponds I’ll never know. 2. Finding out that even though we don’t have kids to bring to the party, our favorite 6 year old twins were very upset the husband and I might not make their party this year. I was super happy we made it even if just for a while. 3. Getting our computer back up and running. On our own. For relatively little money. 4. Sunday morning yoga with the husband. I successfully led us through 90 minutes of yoga. I even made him sweat a little! 5. Sunday afternoon mixology with my niece. 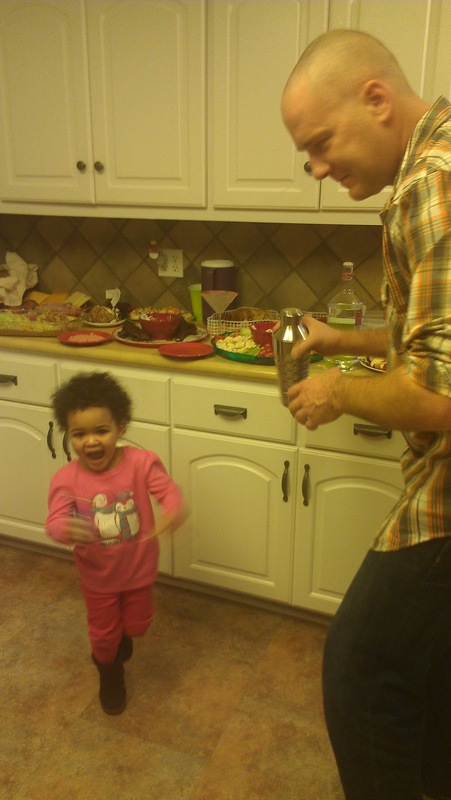 The husband was recruited (by me) to mix martinis at my family holiday gathering and my niece helped shake things up.